With 100 mn+ users already in the country, and the numbers expected to grow phenomenally within the next few years (300 mn+ by 2015) India is set to achieve new heights in the Mobile proliferation. There is a story here – The mobile revolution has been tremendous- from a measly 2% penetration in the early 2000’s. Today the mobile phone is the single most important device in the lives of over 900 mn Indians, with the numbers rising at a mind boggling 2~3 million mobiles per month. The crucial aspect of the success of the mobile has been due to the fact that people use their own language to communicate over the mobile. Had the mobile been a language specific technology, one wonders if it would be as successful. Inclusive growth, rural empowerment and proliferation of Internet over mobile will remain just so many phrases unless key issues are addressed urgently. Today, data in Indic is the key to mobile and Internet adoption. IAMAI, along with W3C India, is holding this daylong event to address some of the issues and challenges being faced by the Digital Industry with regard to Content in Indian Languages being deployed over Mobile Web. A proud moment for India to have so many mobile users. Next 500 million internet users will be from a mobile handset. 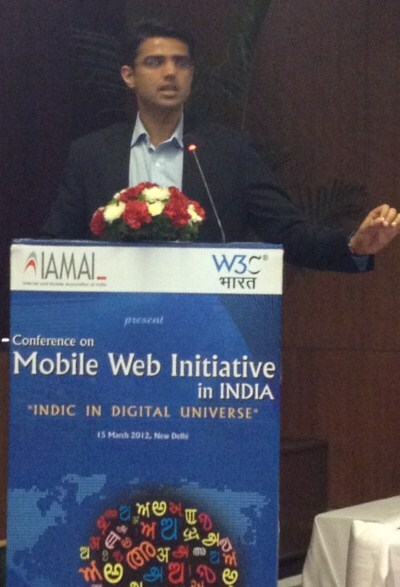 Tangible change in daily life needed, mobile web could bring that change. India has the 3rd largest internet user base. India may be a little behind in technology, but our volumes and not tech should determine the standards (referring to India should be determining W3C Indic standards). Views of India and China needed in governance of internet. Tele-density: 1995 (1%), 2011 (77%, rural 35%), 2020 (rural will be at 100%). Teledensity has improved because of wireless devices (mobiles). 5 billion will be using the internet by 2030. Today mobile internet is still for English speaking, non-English community shouldn’t be at a disadvantage. India doesn’t have relevant local content in local language. Rural would be interested in news, entertainment and not B2B. Bring out good mobile apps, if not free at least keep it cheap. Very soon semi-smartphones will be the default handset. By end of 2012 4G auction is expected to take place. Census 2011 (Housing Index) reports 53% households have mobile phones, a whopping 50% of rural households have a mobile phone. Majority of these can’t read English. Everyone agreed a common framework in India was needed (Unicode) and it is the industry which needs to push for these standards, consumers cannot. Should be active on twitter. If he does get his site up, make sure it is bi-lingual (at a minimum).